If you arrived here from Carolyn’s Blog, you are on the right track. If not, why not head back to the RRR Blog and start from the beginning so you don’t miss any of the terrific projects. 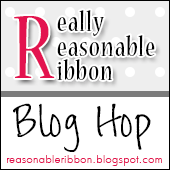 This month the Really Reasonable Ribbon Monthly Ribbon Club Assortment is a fun autumn color collection. I just love all the lovely fall colors. I love the look of layering a pretty print ribbon over a wider satin. I did this under my sentiment panel on this card. My bow is a double-layer bow made with my Bow-it-All V2.0 Tool and finished off with a 15mm Open Rose in the center. Thanks so much for stopping by today. Your next stop is Teresa’s awesome blog. such a well made bow! I love the layering and colors of this card. It is so pretty. Total elegance! Everything is perfectly placed, the bow is fabulous, and the colors are very complementary to one another – well done!